SappoLodge is based on a concept of a lodge in urban area. 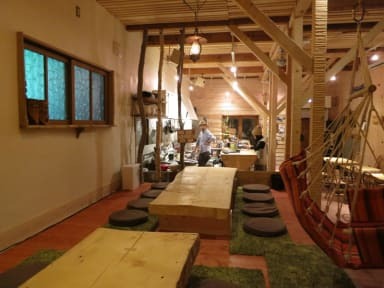 There is a bar full of the warmth of the wood on the first floor, so that all the guests can communicate with other guests and locals. 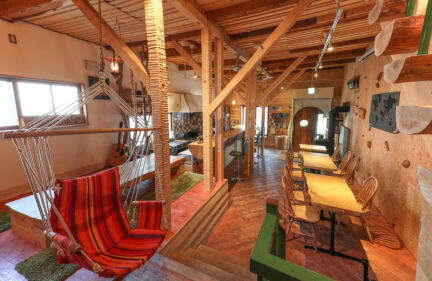 Plus it is 3 minutes walk from Hosui-Susukino subway station. There is also a convenience store located to the near distance of a 1-minute walk. From SappoLodge it is within walking distance to a lot of places. In addition, it is the best in the origin of the journey so close bus and train station. All staff living in Sapporo can suggest you some good spots which are not put on a guide book. Plus you will get some exciting information from locals at the bar. We provide a bigger bed space than general guesthouses, so that we’ve got a lot of good reputation from guests with big baggage's who stayed here for a ski trip and those guests who came from other countries. As all the bedding are down-filled quilt made in Japan, we bet you will have a good-deep sleep. We have a lot of comfortable room. Men's dorm and Female's dorm is large type. Also mix dorm is standard type. Apart from that Japanese-style private room. This room can stay to 1-3 people/room. And private room with twin bed. This room can stay to 1-2 people/room. We hostel bath-room and shower-room is common. and we have common washstand too. You can choose the best room! !